Probably the most popular option of portable beds for kids are portable cribs. Portable cribs are designed to be space efficient, lighter in weight than a full sized crib, and easier to pack up for storage or transportation. For these reasons a portable crib makes a great choice for a second bed to be kept somewhere the child visits regularly or for use during a vacation or even for another bed around the home. Portable cribs often feature a bassinet insert for infants, so you don’t need to bend all the way down to put them to sleep. Additionally, some will have clip on mobiles or change tables. All these extra features are especially useful if you have a young baby. There tends to be two types of portable cribs. The most common type are smaller and designed to pack up and be highly transportable. They can also be used as a portable playpen for children, keeping them safe and contained. This can be extra useful if you will be using the portable crib for travel. The second are larger, and tend to be wooden, intended for heavier/older children or longer term use. 2.1 What is Pack n Play? 3.5 Is a mattress needed? Below is a selection of the best portable cribs 2018 has to offer. You can click on the columns to quickly compare the look, rating, weight, price and suitability of all the best portable cribs and pack n play sets. While there are similarities between portable cribs and travel cribs the two are not the same. They can both be used as an infant portable bed but portable cribs usually can be used as a playpen, and are intended to be bigger, sturdy and stable. They often come with extras, and don’t always come with a mattress. These things can make them bulkier overall. By contrast, travel cribs focus on being small and lightweight when not in use. This allows them to be taken on an airplane as carry on luggage, or fit inside a suitcase to make carrying it around as easy as possible. They do not come with any extras, are usually not designed to be used as playpens and almost always come with a mattress. If you are traveling a lot, especially on airplanes, then a travel crib the better choice. If you’re visiting just one place at a time – and using a car where you have more space – or need something bigger, then a portable crib is better. You can read my full travel crib buying guide here. That does not mean that using a portable crib for travel won’t work. Or that the line between the categories is solid. There are several portable cribs that are as small, light and easy to carry and use as cribs labeled as travel cribs. What is Pack n Play? 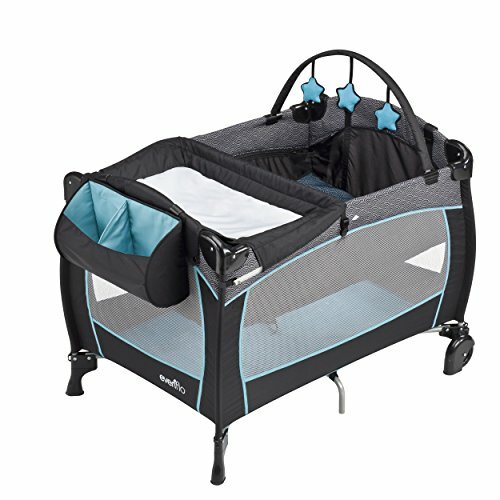 Pack N Play is a brand name for a particular line of portable cribs that are designed to be used as a playpen as well. Pack and play cribs are the same as most other portable cribs. They do not form their own category of toddler portable cribs. What age do you need the crib for? How tall or heavy a child can a crib support? If your have a small child like an infant then a baby portable crib or a crib with a bassinet insert is better. For larger toddlers, one of the portable cribs for toddlers, which are larger and stronger, will be needed. If you need a larger crib that can handle larger children then a portable wooden crib may be the best choice. Do you want your portable crib to double as a play pen? Many are designed for this need in mind, like the Pack n Play brand. Larger portable cribs are intended as a replacement for a bed. 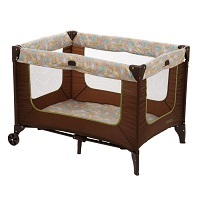 However, most portable cribs can be used to keep your child safe while they play. Do you need to move the crib between locations? If you need a travel portable crib then this will be an important consideration for you. One that is lightweight, compact when folded and is a small portable crib will be essential. Larger, wooden portable cribs are not ideal for this, but can be transported after disassembly when the need arises. It can be good to think about where you will store the crib when not in use to work out what size portable crib is suitable for you. How hard is the bed to set up and pack away? If you need to move the crib around often, in terms of location, then you want one that can be set up as quickly as possible and can be pulled apart just as easily. Not all portable cribs include some sort of mattress, or the included mattress is not very good. Portable crib mattresses are easy to find and buy but some mattresses for portable cribs may make the crib less portable if they do not fold up or shrink in some way. Some research may be required to find the best portable mattress for your needs. 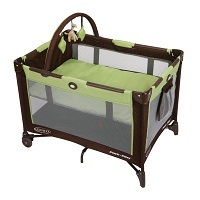 The Graco On the Go Travel Playard is good choice for those who need a portable crib. This crib can be set up in one minute and features wheels on two of the legs to allow it to be easily moved around a house or room. It is also easy to pack up and store, folding up small enough to fit into a cupboard, under a bed or into the trunk of a car. The Graco comes with an bassinet insert, which suspends a baby and mattress from base of the crib in a safe manner, and comes with a clip on change table as well. 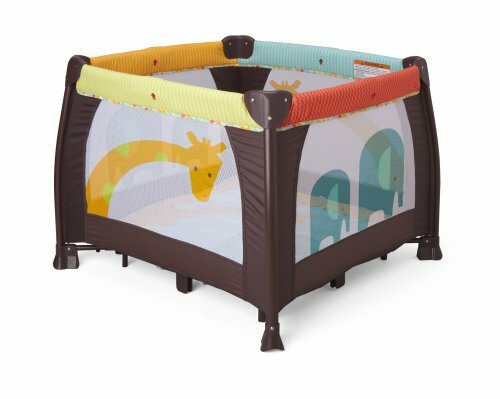 The high sides and strong construction make it good for a playpen as well as ensuring the crib does not tip over when a toddler stands up and leans against the side. Two small drawbacks for the Graco: some people report having trouble lowering the sides of the crib when packing it up due to the mechanism used. Additionally, the high sides make it hard for some people to take children in and out of the crib when the bassinet insert is not used. Read our full review or click here for more information and to see the latest price. The Cosco Juvenile Funsport makes a great portable crib and play pen. With a strong frame it is a great portable toddler crib and easily handles bigger children than its competitors. It is still easy to move around the assembled crib, however, thanks to wheels on two of the legs. It packs up into a small, compact package that is very easy to store in your home or in your car. 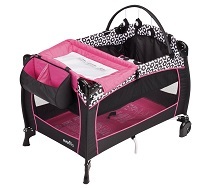 For easier transport it comes with a travel cover that can protect the crib in transit. The Cosco does not come with a bassinet inset or attachable change table. A mattress must also be purchased in order to make full use of the Cosco as a crib as well as a portable play pen. A good portable crib mattress will help. One major drawback is that people have complained about the long time to pack up the Cosco when putting it away. Needing a separate mattress means that the portability of the Cosco depends on how portable the additional mattress is. Click here to see the latest price and for more information. If you are looking for a stylish appearance to your crib, then this is the one for you, in classic style. Aside from it looking great, it is actually a very versatile and multi-functional portable crib, and it takes up around 35% less space than a standard sized crib would do otherwise. 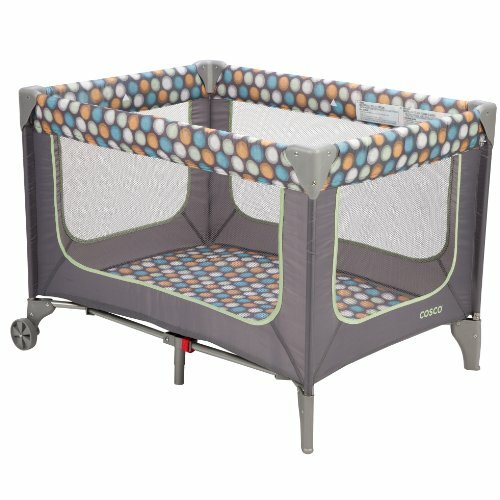 The crib folds flat easily for storage or for traveling from place to place, and is considerably lightweight for this kind of crib, at under 35lb. The crib is also easy to move from room to room, with four caster wheels, whilst meeting all necessary safety standards. The 1” thick mattress can be positioned at two different heights for comfort. You could also use this crib as a playpen, which gives you more uses than just somewhere to sleep. This is a slightly higher priced crib, but its style and functionality really do make up for the minimal extra cost. Click here to see the latest prices and more information. This particular product is ultra-colorful and fun, decorated in jungle animals and evoking imaginations for long play sessions filled with fun! 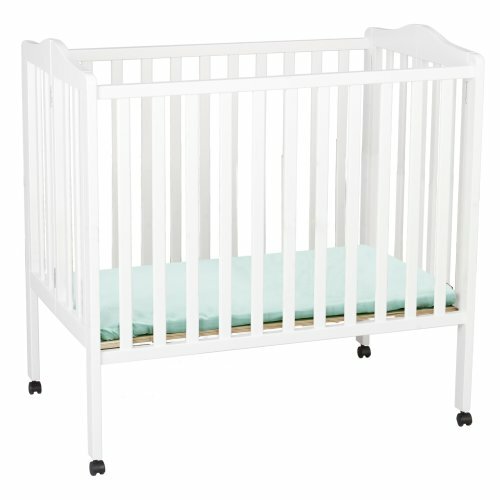 The sides of the crib are mesh, which means parents can easily see what is happening for peace of mind, but it is also a very padded and comfortable crib for sleeping too. It is recommended for children who are under 30lb in weight, and children who are unable to climb out of the high sides. The crib also folds down for easy storage, and is easy to move from place to place, thanks to it being very lightweight. It comes with a free carry bag as well as a thick mattress for comfort. The crib collapses down easily, without fuss, and is a great low cost choice for either weekends away for travel trips which require moving from place to place. The Evenflo is an incredibly lightweight portable crib that features a bassinet insert with an additional clip on mobile, change table and caddy for storage. Despite it’s light weight the Evenflo is very strong, and many people have reported using it for children heavier than its rated maximum of 30 pounds. The clip on change table does not need to be taken off to use the bed, but can be left attached and flipped over. With two wheels on the frame, the Evenflo is easy to move from place to place within a location, and it’s low weight and compact size when all packed up means it is easy to move from location to location. While light enough to be taken as carry on luggage, it is not small enough when packed up to take on a plane… unless you’re flying something better than coach. There are a few drawbacks to the Evenflo. Some people complain that the included mattress is not very comfortable, and that another mattress is needed, which may impact on portability. Secondly, other people mention that the Evenflo can take a while to disassemble. Your can also read our guide to the best travel cribs which also make fantastic portable cribs. 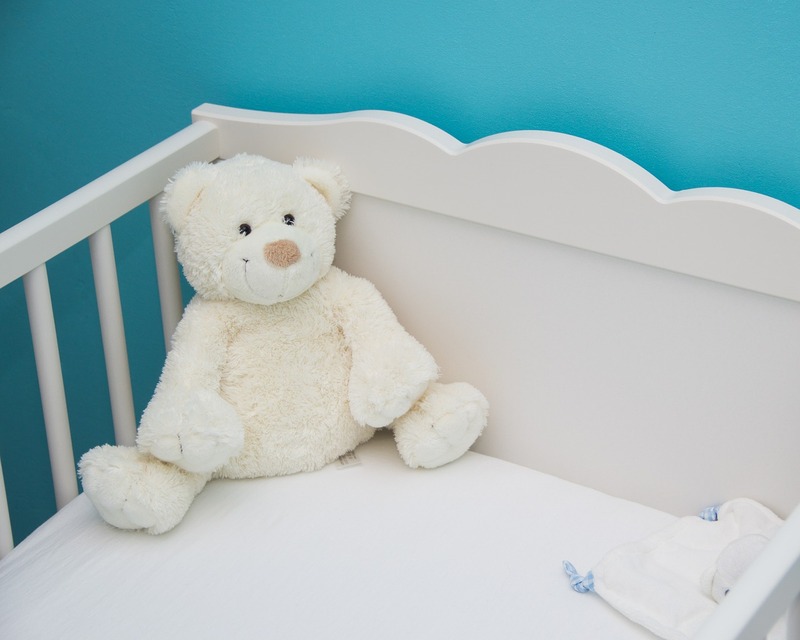 A Bassinet Versus A Crib – Which is Better for My Baby?